Descending from the street level of Daikanyama, you’ll find yourself in a brunch-goer’s natural habitat. There are leafy plants, exposed wooden beams, red brick walls and a light feature made from a bunch of randomly-shaped Edison bulbs suspended at different levels. Behind the light feature is a wall made of portraits of jazz legends and their album covers. This is Blu Jam Cafe, a new brunch spot in town. The name comes from its 10-year-old sister cafe in L.A., which was once an underground jazz club. The cafe is beloved by foreign and Japanese guests alike, who create a buzz of conversation that blends into the downbeat hip-hop thudding in the background. 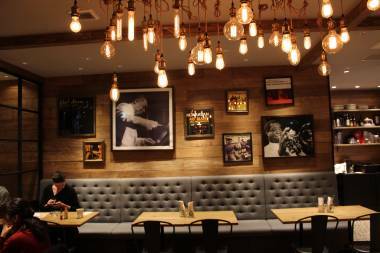 Couples sit on the long couch that stretches along the jazz wall and friends chat over empty plates. The beanie-clad, bilingual staff are easy-going and not afraid to get to know their customers between cappuccino orders. Miku Teranishi, the bright-eyed young managing director, also eagerly flits around and attends the tables. Teranishi, who grew up in Los Angeles, saw the opportunity to bring Blu Jam Cafe back to Tokyo with her. 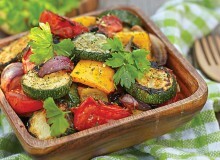 “People love brunch, but also they’re getting more health conscious. L.A.-style food is popular in Tokyo, but really good vegan and gluten-free options are still missing in Tokyo,” Teranishi says. Taking this as ammunition, the Daikanyama cafe officially opened in September last year after a “soft opening” in March, where chefs practiced dishes and perfected final touches. The dishes are all incredibly creative and it was very hard not to order everything. Classic Western-style brunch suspects are tweaked with Mexican and Italian flavors. There’s an obvious focus on vegan and gluten-free dishes, but you’ll still find your Eggs Benedict appropriately accompanied with an English muffin, bacon and ham. The prospect of a brunch carbonara risotto was a no-brainer, so we order that first. Teranishi describes it as a childhood hug, and with the generous amounts of bacon surrounded by steaming arborio rice smelling of Parmigiano-Reggiano, complemented with bursts of freshness from green peas and a house-made pistou, it’s easy to see why. Two perfectly poached eggs sit on top. They collapse brilliantly when we release the yolk over the risotto, and I swear I could hear angels singing. 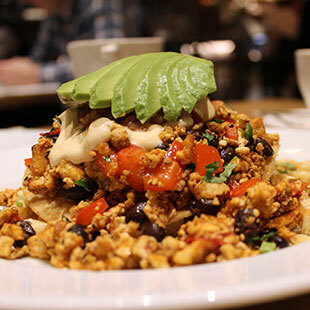 The vegan rancheros is a colorful, messy mountain of food piled onto a crispy corn tortilla. Red bell peppers, cilantro, tiny pillows of grilled potato, tomato salsa, black beans and scrambled tofu are finely chopped and thrown together. The chipotle packs a punch, so we didn’t touch the Tabasco sauce we originally thought we needed. The rancheros is topped with a fan of sliced avocado and a vegan sour cream made of blended tofu. It didn’t taste like much but added a decadent creaminess. 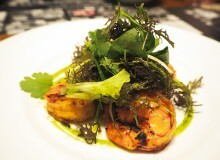 Teranishi says she’s very proud of this dish because it can be found nowhere else in Tokyo. For something so healthy (vegan and gluten-free), it was undeniably delicious and unrelentlessly spicy. 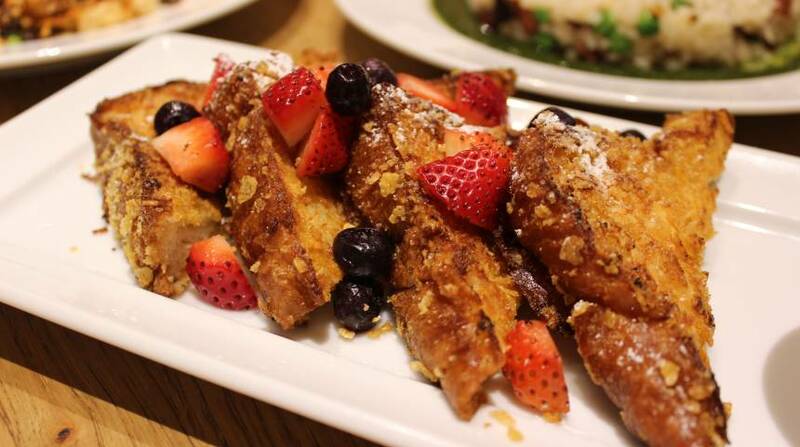 We finish with the crunchy french toast. It’s their signature dish and very popular among customers. A coating of corn flakes makes it extra crunchy and the vanilla flavor is further enhanced with a vanilla bean sauce. Topped with fresh blueberries and strawberries, this was a very satisfying finish to the meal. The cafe was as busy as you’d expect during peak-hour brunch time, but it still had a very relaxed vibe. One group of people looked well settled in, even playing board games in the back of the cafe. But to be sure that you can slump back into that couch after polishing off a lazy brunch, it’d be smart to make a booking. 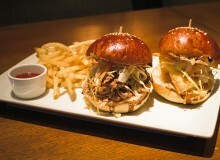 The dinner menu is also inspired by brunch foods. All meals are quite sizeable and the menu is excruciating to pick from: It was very hard not to order the steak hash made of grilled beef tenderloin with spinach, mushrooms, poached eggs and hollandaise sauce. The vegan tofu Reuben sandwich was also attention-grabbing, containing grilled tofu, sauerkraut and house-made vegan chipotle 1000 island dressing (what a mouthful!). Next time, I’m taking a huge group of friends to order as much as we can. Daikanyama. Tel: 03-6455-1446. 11am–10pm, closed Tuesdays. Last orders at 9pm.